A totally mind-blowing adventure that is hysterically funny in its distinctive way, that's "Night At The Museum 2: Battle Of The Smithsonian". This new wave of comedy is fresh and seldom done because of the complexity needed to create a great story within just a museum. Larry Daley (Ben Stiller) reprises his role and goes on a quest to save his exhibit pals, Jedediah and Octavius, who are being shifted to the Smithsonian Institute. They also have to face the wrath of Kah Mun Rah, a new villain who comes alive at the institute. You would probably think that this is just a movie where there is a guy in a museum interacting with all the statues that came alive at night, complete with the same computer animation you have seen over and over again in contemporary Hollywood movies. Your expectations are bound to change within hour and hour into the show! The movie has a plot that is outstandingly genuine, with an abundance of references to American multi-cultural history and world history related to the US. You can see different races, trends and social issues from many different eras. Each of the actors and actresses who played the role of the museum exhibits did an excellent job in portraying them. They really got the characterisation spot on for those people who lived in different times, from the way they talk to the way they behave. 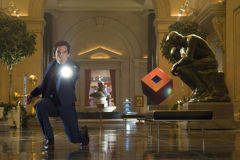 "Night At The Museum 2" is a graphically rich movie, utilising computer special effects in a very innovative way that is different from the first movie. Surprisingly, it is not just interesting in terms of visuals but also in terms of sound. You can just imagine what are the many fun things that you can do if you can experience every story told in the museum first hand. The jokes in the movie are not your typical comedy movie jokes. The creators of the movie manage to turn something that we usually consider lame or cliche into something funny. The last time we got to see a fictional action hero jump out of the screen and into the real world was "Last Action Hero (1993)" with Arnold Schwarzenegger. "Night At The Museum 2" is a similar kind of comedy that stands out from the rest of its kind by having more groundbreaking features and characters that tells even more stories.